Welcome to the rapidly expanding world of cannabis concentrates! Simply put, concentrates are cannabis-derived extracts that contain concentrated amounts of the psychoactive compound tetrahydrocannabinol (THC) and a multiplicity of other cannabinoids and terpenes. Despite the fact that most concentrates today are produced using modern technologies and extraction methods, they have a very extensive and established history. The first known uses of concentrated cannabis can be dated back to 10,000 B.C. in the Steppe Mountains of China. Popularity and demand for concentrates have increased dramatically with the legalization of marijuana in several states. This exponential growth in consumer interest has refined concentrate extraction methods to innovative heights, which is why so many new and exciting forms of concentrates are emerging. Concentrates are a great option for seasoned cannabis consumers looking to increase the intensity of their high, as well as flavor connoisseurs seeking to taste the most exquisite terpene profiles. Medical marijuana patients in need of relief also turn to concentrates for a direct, economical and fast-acting solution to their ailments. Some of the earliest concentrate processes originated in Eastern Asia. The oldest method of creating concentrates simply involves rubbing cannabis flowers between hands, scraping the collected trichomes and compressing them to form a moldable and dark amalgamation, known as Charas (the Hindi word for Hashish). In the 12th Century, smoking hashish was highly popular in the Middle East. Arabic for grass, "Hashish," or "Hash," is the product created when marijuana flowers are sieved through a screen, also known as "dry sifting," and processed with heat and pressure. Dry Sifting is a process used to separate the resin glands, called trichomes, from other plant matter. The extracted trichomes, with a powdery appearance, are commonly known as kief. Most take the process a step further and add heat and compression to the kief to form blocks of hashish. Hashish is the oldest form of concentrate known to man and despite the illegality of cannabis in some of the Middle East, countries like Lebanon and India still produce black market hash for export. There are many ways to collect the resin glands from cannabis flowers, but arguably the most common method of trichome collection over the years is facilitated through the use of a three-chamber grinder. During the grinding process, trichomes are sieved through a mesh screen and broken off of the cannabis flower through what is known as agitation. The collected trichomes can then be used for a variety of concentrate production methods, or simply smoked as kief. Since hand-rolling Charas, extraction processes have come a long way. Through developments in technology and further scientific and chemical discovery, concentrate extraction has become a highly sophisticated and modernized practice. Lab-grade equipment is utilized for both solvent-based and non-solvent extraction methods, capable of producing a wide variety of different concentrate types and consistencies. Most concentrates are named after their appearance. For example, the names shatter, wax, and budder all refer to the consistency of the concentrate, although it is the method in which they were created that determines the difference in melting points, appearances and price. While many concentrate products are similar in THC percentage, they all have different melting points, cannabinoid profiles and appearances. Today, there are two main methods of creating cannabis concentrates, solvent-based extraction and non-solvent extraction. Let's go back to high school chemistry for a bit. A solvent is just a liquid in which something is dissolved to form a solution. In extraction, a solvent is just a liquid used to separate the psychoactive compound THC (as other cannabinoids and terpenes), from the cannabis flower. The most popular solvents used today are butane, carbon dioxide (CO2), propane and alcohol. Even though water is technically a solvent, in the marijuana industry it's considered a non-solvent extraction method. These processes are similar to creating essential oils and vitamin capsules. Remember that although most concentrates are known by their appearance, the real difference between most products is how it's made, not its final form. Dabbing is the most popular way to consume marijuana concentrates. Often called "doing a dab" or "taking a dab hit," dabbing simply refers to the vaporization and consumption of a marijuana concentrate. On average, the concentrate a consumer might dab has between 60-80% THC, compared to smoking cannabis flower which averages 10-25% THC. For this reason, dabbing is much more economical for most users, as far less product needs to be consumed to reach optimal or desired effects. The effects of a dab usually come on stronger and quicker than smoking flower. Because of this, dabbing is often recommended for experienced or frequent smokers due to the high potency of the product. While it is possible to use concentrates as a "bowl-topper" over flower, most consistencies other than bubble hash do not vaporize effectively with this method. The most effective way to consume cannabis concentrates is dabbing with what is known as an "oil rig" or "dab rig." Rigs are essentially water pipes made for dabbing that are designed specifically to bring out the complete flavor profile and potency of the concentrate being consumed. In combination with a titanium or quartz nail, a dab rig is the most optimal and efficient way to vaporize and consume concentrates. The method of dabbing is also more complicated than smoking flower. While flower can be relatively simple to pack into a pipe, bong, blunt or joint, a few more tools are necessary for dabs. In order to effectively consume concentrates, a torch, a rig with a titanium or quartz nail and dabbing tool are needed. The titanium or quartz nail is inserted in place of a traditional sliding bowl, and is heated by the torch. Optimal dabbing temperatures are regularly debated within the cannabis community, and "low-temp" dabs have taken the concentrate scene by storm in recent history for those seeking the purest of flavors. For novice users, just be sure to wait until the nail is not red hot to ensure vaporization of the product and not combustion. To take a dab, consumers apply the desired amount of concentrate to the dabbing tool, heat the nail, wait until the nail reaches the perfect temperature, gently touch the concentrate to the nail and inhale. To achieve even vaporization and convection within the dish of the nail, most experienced dabbers will use what is called a "carb cap" to cover the nail and evenly distribute heat. Using a carb cap allows for better flavor and more economical and even vaporization of the concentrate. Some consumers use electronic nails, or e-nails, which are heated to a specific temperature by a small machine. E-nails are often high in price and not very portable, so be sure to research if they are right for you before making an investment. Another dabbing apparatus is a honey straw. A honey straw, or nectar collector, is essentially a portable nail that allows concentrate consumers to travel without lugging their rigs around. Some honeys straws have a middle chamber where water can be filled to induce percolation, similar to traditional rigs and water pipes. Remember, portions aren't just for food. Novice dabbers should only try a very small amount of concentrate initially until they fully understand how it will affect them. A good tip for starters is to take a dab of concentrate about 1/2 the size of a grain of rice or smaller. Terpenes are chemical compounds found in cannabis that produce the distinct flavor and smell of the flower. That means the tangy, citrus scent of Lemon Haze or the blueberry, sour smell of Blue Cheese is created by different terpenes. In a more general sense, a terpene is any group of hydrocarbons found in the essential oils of a plant. In cannabis, terpenes are produced by secretory cells found within glandular trichomes. Terpenes are produced similarly in fruits as well. For example, the same tangy, citrus terpene found in Lemon Haze, called limonene, can be found within the oil glands in the skin of oranges as well. There are over 100 different terpenes that have been identified in cannabis plants. Terpenes not only influence the smell and taste of a plant, but also influence the effects of each strain of cannabis. In recent years, strains have been grown to produce the highest THC levels possible. 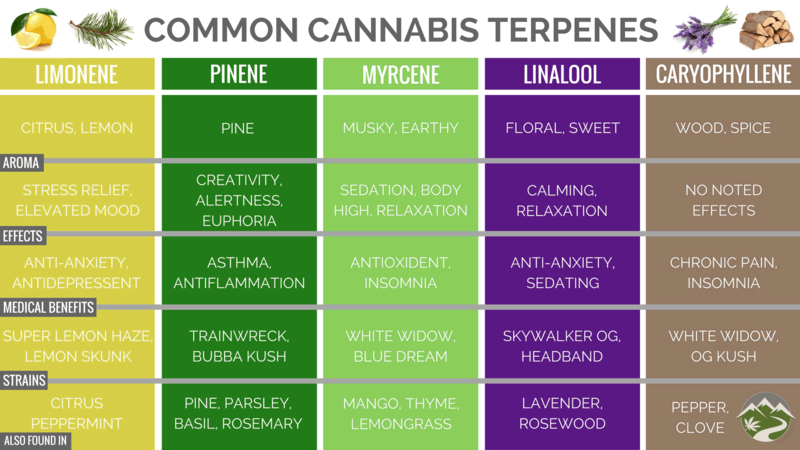 Regardless of the goofy strain names, it is the combination of terpenes and THC that impact the psychoactive effects. Many experienced cannabis consumers even claim they can determine "good bud" by relying on smell alone. Some of the most common terpenes include Limonene, Alpha-pinene, and Myrcene. Limonene, found in most citrus fruits, can promote weight loss and improve mood. Alpha-pinene is the terpene that gives pine trees their scent and has anti-inflammatory properties that are helpful for those with asthma. Myrcene smells musky with a hint of berry; it is great for pain-relief and has sedative properties as well. Trichomes are the small hair-like structures found on cannabis flowers that contain terpenes. Biologists hypothesize that trichomes evolved to protect the plant from environmental dangers such as animals looking for food, insects and bacteria or fungus. The word trichome comes from the Greek word meaning "hair." There are three main types of trichomes: bulbous, capitate-sessile, and capitate-stalked. Right now we can think of them as small, medium and large respectively. Most bulbous trichomes are hard to see, even magnified, and protrude similarly to goosebumps on skin. Capitate-sessile trichomes are much more numerous and have a rounded head. It's often difficult to see the stem and they appear to lie flat against leaves. Capitate-stalked trichomes are the most abundant and are raised from the leaves with elongated stalks. Capitate-stalked trichomes usually contain the most cannabinoids due to their larger size and are the main focal point of cannabis macro-photography. In their unprocessed form, the stalk-like trichomes, when collected, are often referred to as kief, which is smoked frequently by cannabis consumers. While kief is technically considered a concentrated form of THC, it is important to note that it is an unprocessed concentrate. As discussed earlier, the final form of kief is comprised of many individual trichomes, meaning that it has not undergone an extraction process amalgamating it into a cohesive and unified final product. In order to process trichomes into a stable and concentrated product, a variety of processes may be used. Despite the slightly technical nature of trichomes, they're vital in the creation of concentrates. Because of the recent rise of concentrate popularity, most extraction methods are catered to preserving the healing powers and flavors developed within trichomes. Flavor, medicinal effects and strength of the effects continue to be the staples of concentrate efficacy. With all three aspects getting stronger every day, as well as technological advancements in scientific equipment, it's not far-fetched to believe extraction artists will continue to innovate and progress concentrates to greater heights. Let's take a moment to recap and ask, why consume concentrates? Concentrates are rapidly growing in popularity for a plethora of reasons. They are much more potent than flower, providing a more economical way to consume cannabis. Because of the high potency, they also allow medical patients to achieve faster relief than flower or edibles. Concentrates are also more efficient than flower, allowing patients to remedy medical ailments efficiently with a quick, large dose of cannabinoids. The difference in flavor between concentrates and flower is also pretty dramatic. Cannabis extracts not only concentrate cannabinoids, but also the tasty and beneficial terpenes. The flavor resulting from concentrate vaporization allows consumers to taste terpenes more clearly, instead of having the terpene flavor mixed with combustible plant matter (this occurs while smoking flower). Dabbing also allows cannabis users to consume in a more discreet manner. Concentrate vapor does not stick on clothes or residually hang in the air like combusted cannabis flower might. In places like Colorado, where many residential properties might ban the use of marijuana inside, concentrates make it possible to consume cannabis tactfully. The last thing any new dabber should do is smoke too much at once. Infrequent smokers can experience adverse reactions to concentrate consumption such as rapid heartbeat, paranoia or even hallucinations. For novice cannabis consumers seeking less intense concentrate highs, or those who still aren't sure if concentrates are for them, vape pens are the perfect introduction. Most of the concentrated marijuana in vape pens are oils created with CO2 that can be smoked slowly, decreasing the chance of taking too large of a hit and feeling an intense or uncomfortable high. As previously mentioned, there are two main methods of creating cannabis concentrates, solvent-based extraction and non-solvent extraction. In solvent-based extraction, chemical solvents such as butane, propane, carbon dioxide (CO2) and alcohol are used to separate resin glands containing the psychoactive compound THC from the cannabis flower. In non-solvent extractions, water, temperature and pressure are the predominant factors. Again, it is important to note that even though most concentrates are known by their appearance, the real difference between products is how they are made. Different extraction methods alter the chemical and biological makeup of the final product form in ways that are not forthright to the naked eye, which is why it is always important as a consumer to understand the process behind the product. While many side in favor of non-solvent extracts, the argument for solvent-based extractions is strong too and has many devout supporters. Now that the perceived dangers of producing solvent-based extractions have been alleviated by certified extraction lab requirements, there is minimal risk for explosion or safety hazards. Many people believe solvent-based extractions to be more potent, containing what is called a "full-spectrum" of cannabinoids and terpenes that greatly influence the flavor, aroma, and effects of the concentrate. Because the flower is not physically agitated (like bubble hash or rosin) and cannabinoids are pulled from the plant by passing solvent, the structure of the bud is kept intact throughout the process. Not only does this reduce plant matter from being accidentally extracted, but also preserves terpenes remarkably well. Both solvent-based and non-solvent concentrates are superb methods of consuming cannabis, and by knowing the key differences consumers are able to make educated decisions based on their personal preferences. One thing is certain however, no matter which extraction method you choose, there are no shortages of effective, high-quality options to select from in either variety. Solvent-based extractions utilize chemical solvents to strip cannabis flowers of their highly potent resin glands. Because chemical solvents are often highly flammable, professional extractors use what are called "closed-loop" systems to ensure that there is no airborne chemical exposure during the process, therefore eliminating any risk for fire, over-pressurization or explosion. This is why concentrate production should only be conducted by licensed professionals. It is extremely dangerous and illegal to perform solvent-based extractions at home, so leave the process to the professionals! After a solvent has passed through the flower and collected its cannabinoids, the resulting product is referred to as slurry. Slurry is the mixture of cannabinoids and unpurged solvent, and can look a variety of ways depending on the solvent used. Mainly, slurry looks like either a runny liquid form, or an airy patty/loaf. Slurry contains high amounts of residual solvent and is not considered safe to consume. In order to turn slurry into a finished and compliant product, purging must be implemented. In any solvent-based extraction, whether butane, CO2, propane, or alcohol, extensive purging is required in the post-extraction phase to rid the product of residual solvent. Purging is a broad term in the world of concentrates, as it can be achieved through evaporation, vacuuming or hand-whipping. Each method of purging has different variations and produces a different end product and consistency. While there are many different options for solvent purging, vacuuming is predominantly considered the most popular. When a solvent is purged by vacuum oven, it is being deliberately pulled from the slurry and the air within the vacuum, leaving behind a low parts per million (ppm) of residual solvent. Vacuum purging duration varies depending on many different factors and can last up to 72 hours in some instances. Solvent-based concentrates are considered less healthy than non-solvent concentrates by some. One of the biggest concerns is that inhaling residual solvents may be unhealthy, however no scientific data backs this claim universally, as residual solvents are present in many Food and Drug Administration (FDA) regulated consumer products like cooking sprays, air fresheners, and canned shaving creams. Little research has been done on the health effects of residual solvents contained within solvent-based concentrates, and ultimately it is up to the consumer to choose which concentrate is best for them. Butane hash oil (or BHO for short) is a solvent-based extraction that utilizes butane as a solvent. BHO offers a variety of end products with high potency including budder, shatter, wax, sap and more. Typically speaking, flower or trim is placed in a receptacle tube while butane is forced through, essentially stripping the plant matter of its cannabinoids. The material is contained while the gas is released, hence the term "blasting," which is commonly used when referencing the process. Butane was one of the first solvents used in concentrate extraction and is the common culprit of open-blasting induced explosions. Because of its low burning point butane is extremely volatile, which is why it is unsafe to use outside of a closed-loop system. CO2 extractions use temperature and pressure to effectively extract elements of the flower or trim. Facilities with advanced technology and machinery can experiment with supercritical carbon dioxide methods, which keeps CO2 at high pressures. In other words, extractors can finely control the rate at which cannabinoids and terpenes are extracted. Many advancements have been made recently in the equipment used for CO2 extraction, with high-end models nearing one million dollars to own and operate. These machines use computer interfaces to calibrate diagnostics and fine tune the desired extraction parameters. Depending on the equipment used, CO2 extractions can have multiple receptacles for slurry, resulting in tiered grade products that can easily be separated and used for different purposes. Similar to BHO, cannabis extractions using propane are called propane hash oil (or PHO). Although this method usually demands higher pressure, it also requires a lower boiling point, which means better terpene preservation and faster/more effective purging. PHO offers end products similar to BHO, such as wax, budder, shatter, live resin and more. Propane has risen in popularity for solvent-based extraction in recent years and is generally considered a cleaner final product than BHO. Propane is slightly more expensive than butane, but is worth the additional cost for extraction artists seeking to boost their concentrate flavor, consistency and overall value. Typically speaking, cannabinoids and terpenes from cannabis flower, trim or hash dissolve fairly easily in alcohol (specifically isopropyl alcohol or ethanol). This method of extraction is also considered one of the safer options, but requires exact temperature control for optimal results. Extraction using isopropyl alcohol is also known as "QWISO," or quick-wash isopropyl alcohol. Conducive to its name, this process can be completed rather quickly and easily using minimal equipment. However, not many licensed facilities use isopropyl alcohol, as the more popular alcohol solvent is ethanol. Ethanol is a fairly expensive solvent to use for extractions, but it has an extremely high recovery rate. That means it can be used for extraction, and be recovered afterwards through rotary evaporation or another form of solvent reclamation. CO2-extracted concentrates in the form of an oil have become increasingly popular over the years. This supercritical fluid extraction is created with large amounts of pressure and carbon dioxide and is seen as an incredibly effective method to separate plant material to produce an amber oil. CO2 extraction is gaining popularity in commercial extraction operations due to the fact that the equipment used is able to finely tune desired results and end products. CO2 is often preferred to other extracted oils because it's incredibly efficient and yields purer, cleaner product with limited processing and low residual solvent. Because CO2 is a naturally occurring substance and is produced by the human body, it is widely considered as a natural solvent with less health concerns than butane, propane or other hydrocarbons. The opportunity to tune the process is key, while its sterilizing component allows end products to last longer than most. Typically, CO2 oil is found most often in pre-filled oil cartridges (alongside a medical grade solvent, polypropylene glycol) for vaporizers as well as edibles. CO2 Oil varies on price depending on the dispensary, however, expect to pay between $40 AND $80 per gram. Arguably the most well-known type of dabbable concentrate, wax is made by blasting plant material with a solvent using a closed-loop extraction system. The resulting slurry is heated at low temperatures and whipped vigorously to remove all residual solvent. Because the product is whipped by hand, it gains airy peaks that are similar to whipped topping. Wax is generally drier and more crumbly than its counterpart budder. As stated above, the finished product resembles a "whipped" consistency and ranges from a variety of amber shades complete with a milder aroma and flavor profile. Budder is essentially wax with higher moisture content. The consistency of budder is oily and malleable, while wax is crumbly and more solid. Budder contains a higher moisture content because it is whipped less than wax. Remember, many hydrocarbon extractions are similar in nature, but it is the finishing techniques that determine the appearance and consistency of the final product. Wax/budder varies on price depending on the dispensary, however, expect to pay between $15 AND $40 per gram. Live resin is made the same way as wax, however the starting product is fresh frozen plant material. By using cryogenically preserved plant material, the finished product has robust, exceptional terpene and cannabinoid profiles that resemble the qualities of the live plant. Live resin is known for its excellent flavor and resemblance to the aroma and taste of the live plant. It ranges in color from light amber to yellow-gold and has a moist, shiny looking exterior with a strong, rich smell. Recently, live resin has broadened its horizons, with many different consistencies and naming conventions. There are currently many "live" products on the market that exhibit high terpene and cannabinoid content and are extracted from fresh-frozen starting material. For example, live sugar is a form of live resin that looks like an amber sugar patty, while live budder is a smoother, more malleable consistency. No matter what the name is, live resin and its many variations offer the best flavor profiles and are frequently enjoyed by connoisseurs and novice cannabis consumers alike. Live resin varies on price depending on the dispensary, however, expect to pay between $30 AND $80 per gram. Shatter is made by blasting plant material with a solvent using a closed-loop system. The resulting slurry is collected onto parchment paper and placed in a vacuum oven for solvent purging. After "burping" the slurry (this helps release as much solvent as possible) a few times the shatter starts to take shape and slowly spreads across the paper. Times in the oven can vary anywhere from 45 mins to a full day to achieve optimal consistency. Sometimes during the process (depending on the starting product), the shatter might not purge correctly resulting in a very "taffy-like" concentrate, reminiscent of salt-water taffy in texture. While shatter is typically stable and easy to handle and snap, taffy is closer to budder in its consistency and stability. Shatter ranges in color from light to dark amber and is high with terpene content, resulting in superior aroma and flavor. Taffy exhibits similar attributes to shatter in regard to appearance, aroma and flavor. Shatter/taffy varies on price depending on the dispensary, however, expect to pay between $20 AND $60 per gram. Distillates are newer concentrate products and utilize highly scientific equipment to heat and vaporize the THC and CBD within the flower, bringing the vapor into a cooling system for consolidation and eventual collection into beakers. This process is repeated over and over again to create pure cannabinoids without residual solvents or plant matter. A method called “short path distillation” is used to separate and collect cannabinoids from contaminants to create a clean, clear final product. The process of short path distillation leaves little terpene content. They are generally lost in the extraction process due to the amount of heat used. However, extraction artists and companies are introducing terpenes into the post-extraction process to create specialized and sought after flavors. Distillate varies on price depending on the dispensary, however, expect to pay between $50 AND $120 per gram. Pie crust is made by blasting plant material with a solvent using a closed-loop extraction system. The resulting slurry is collected onto parchment paper and placed into a vacuum oven for solvent purging. After the purging interval, the concentrate patty is pressed to promote faster nucleation, turning it from a shiny shatter looking substance to more of a cookie crumble, honeycomb look. The final product delivers an amber color with a strong aroma and overall flavor. Pie Crust varies on price depending on the dispensary, however, expect to pay between $20 AND $40 per gram. Cannabis caviar sells for nearly four times the normal price of top shelf strains and is made by soaking cannabis flower in powerful hash oil. Afterwards, the soaked flower is coated in kief and dried until ready for consumption. When dry, then final product will have a very pungent aroma with exceptional flavor. It looks similar to regular flower, however the kief-coating hash oil gives off a vibe similar to that of a cocoon. Naturally, it's extremely potent and lasts much longer than normal flower when burned. Jelly hash is a very potent mix of kief and hash oil. Although it's fairly uncommon to find, it has proven to be extremely effective for patients undergoing chemotherapy or individuals suffering from chronic pain, nausea and other illnesses. With its jelly-like consistency, jelly hash has a mild aroma with an earthy flavor. Caviar and Jelly Hash varies on price depending on the dispensary, however, expect to pay between $30 AND $60 per gram. Non-solvent extraction processes typically involve using ice to chill cannabis flowers to sub-zero temperatures, agitating the resin glands to detach from the epidermis of the flowers. Heat and pressure extraction methods are sometimes implemented to make non-solvent concentrates as well. Typically speaking, they're smooth-hitting concentrates that highlight the product's aroma, flavor and overall effects better as compared to other extraction methods. Recently, non-solvent concentrates like rosin and full-melt bubble hash have risen to popularity since they are extracted without the use of chemical solvents, comparing similarly to the cannabinoid and terpene profiles of solvent-based extracts. Non-solvent concentrates are arguably considered a healthier form of concentrate due to the absence of any residual solvent on a parts per million (PPM) scale, although all medical and legal solvent-based concentrates produced are purged and tested extensively to ensure residual solvent ppm levels are in adherence with FDA regulations. Contrary to belief, non-solvent extraction processes result in products that have equal to higher potency than those created with solvents. As a result, these traditional extractions remain popular with purists and new consumers who care about what chemicals they're inhaling (or technically not inhaling) as well. Attention to detail is critical in non-solvent extraction processes, as there are many factors that need to be considered to make a high-quality end product. The most important aspect of the entire process is understanding that the quality of the finished product is a direct result of the quality of the starting material. In other words, you get out what you put in, so using the best quality starting material is key to creating superior non-solvent extracts. For example, if the starting material does not have a high trichome content, the yield of the extraction and end product will be lesser quality than an extraction using product that is heavily frosted with trichomes. Arguably the best non-solvent concentrates are created with fresh-frozen, high-quality cannabis flowers. Because there are no chemicals introduced to the process, the chemical structure of the plant remains unaltered, resulting in rich and complete terpene and cannabinoid profiles. Kief is the simplest and most traditional type of concentrate available. The process used to extract it typically involves cannabis flower and specialized, fine filtering screens or tumblers. By rubbing the flower against the screen, trichomes are agitated and isolated, effectively producing product comprising of collected trichomes. Anyone can extract their own kief through a three-chamber grinder, which features a screen in the bottom level to help collect the trichomes. Depending on how coated with trichomes the flowers being used are, it may take a few weeks to get a decent amount to consume. Kief is very fine in texture and often takes on a light brown or tan coloring and mimics the flavor of the flower it came from. It can be used on top of a bowl or consumed on its own. As mentioned earlier, this form of cannabis is more potent because the majority of cannabinoids and terpenes are found in trichomes. Live kief is made from fresh-frozen flower, meaning the plant was cut at harvest and immediately frozen to keep all of the cannabinoids and terpenes of the live plant intact. After a quick liquid nitrogen bath, live kief is extracted similarly to regular kief through agitation. Live kief is often preferred because it yields more potent, flavorful, and aromatic product. Live kief has similar aroma and texture properties as normal kief with a slightly lighter appearance. In particular, the aroma resembles the smell of the live plant and flavors are naturally stronger. Kief varies on price depending on the dispensary, however, expect to pay between $10 AND $30 per gram. Bubble hash (also known as water hash or ice water hash) is a non-solvent product made using ice, water, and fine micron bags (often referred to as "bubble bags") to filter out plant material and other waste. Bubble hash is a popular concentrate (especially for those new to the concentrate space) that originally gained momentum around 10-12 years ago. Producing bubble hash is debatably the safest extraction technique known to man. Ice water is used throughout the process to freeze the trichome glands, making it easier for them to become agitated, snap off and sink to the bottom (as trichomes are heavier than water), while unnecessary plant matter separates and rises to the surface. The resulting product is extremely rich with trichome heads and stalks, although additional sieving and drying is necessary to remove any residual plant matter and evaporate any additional water. The process is rather simple. First you must decide on how many bubble bags to incorporate in the extraction. A six or seven bag operation is considered typical, and provides a good striation of micron sizes. Generally speaking, most bubble bag sets include 25, 45, 73, 90, 120, 190, and 220 micron bags. The bags are sequentially placed inside an appropriate-sized bucket, with the 220 micron bag placed last in the bucket. In a traditional bubble hash extraction, the 220 micron bag is considered the "work bag" and houses the starting flower material during the extraction process. Another method is sometimes used however (most commonly in commercial operations), which usually omits the work bag from the process. When washing large quantities of flower, a piece of machinery known as a washing machine is often implemented. This handy equipment works in similar fashion to a traditional washing machine and gently agitates the product at set intervals (think automated spin cycle for flower). When using a washing machine to make bubble hash, the micron bags are still used, but not within the washing machine. Instead, water, ice and the starting flower material are mixed within the basin of the washing machine. Once the washing segment is complete. The resulting water containing the extracted trichomes is drained from the washing machine into the bucket containing the sequenced bubble bags. From there the process is the same as a hand-washed extraction. The bubble bags holding the trichome-rich water are carefully lifted up and shaken to drain the water back into the bucket. What's left in the bag is a patty of trichomes. This process is repeated for each bag throughout the process and the hash collected from each bag is separated, dried, and cured. In some instances, the patties are frozen and grated onto parchment paper to create a fine, sifted product that can be gently pressed into a single form, or pressed more firmly in a rosin extraction. Bubble hash comes in a variety of qualities and consistencies and is commonly graded based upon the micron level of the screens used and a "star" scale, with 1* being the lowest grade and 6*, or full-melt, being the highest. Quality bubble hash will look tan or golden in color with a sand-like consistency, lacking any visible plant matter. Additionally, quality bubble hash should technically bubble and, depending on star grade, melt when heat is applied. Full-melt (see below) can be dabbed and vaporized completely without leaving behind residual combusted plant matter, half-melt (3*-5*) contains traces of plant matter and will not vaporize fully (ideally used as a bowl-topper or inside of a joint), and cooking grade hash (1*-2*) is even more contaminated and will not melt efficiently. Having said this, full-melt bubble hash is more difficult to create without having the proper equipment and quality plant material. Consumers should always ask about the product before they buy. What specific plant was used, is it a full-melt product and how it was processed are great questions to ask in order to find the best bubble hash possible. Bubble hash varies on price depending on the dispensary, however, expect to pay between $25 AND $50 per gram. Full-melt bubble hash is produced similarly to bubble hash but generally is more refined in nature and intended for dabbing or vaporization purposes.. The starting material used for this process is fresh-frozen flower or trim, which means it was cryogenically frozen directly after being cut down. By using fresh-frozen starting material, the final product yields a more robust terpene and cannabinoid profile. Typically speaking, full-melt bubble hash is much more pungent and slightly more potent than traditional bubble hash. Again, the quality of the final product is highly dependent upon the starting material. For the best results, only high quality flower should be used for the production of full-melt bubble hash. In terms of processes, the material is run more gently in comparison to the bubble hash process. This is because only trichome heads are desired in this method. In traditional bubble hash extraction, both the stalks and heads are agitated from the plant and collected, but with full-melt, only trichome heads are extracted, rather than a mix of heads and stalks. Trichome heads, or the bulbous tips connected to the stalks, contain and produce more terpenes, resulting in a superior flavor profile. It is critical that the washing process is very gentle, as more trichome stalks in the process will produce a less-refined final product. As stated earlier, the extraction process is quite similar to bubble hash, as ice, water and micron bags are utilized to collect the trichome heads from the plant. This process can either be hand-washed, or gently washed within a washing machine. After extraction, the product is collected and freeze-dried into patties. Once the patties complete the freeze-drying cycle, they are sifted over parchment paper with a fine mesh screen. The sifted, dried, and separated final product looks similar to kief, but contains no plant matter and is light brown to white in color. Full-melt bubble hash can be dabbed, used as a bowl-topper or gently pressed into a solid state. The pressing process is not the same as rosin pressing however. Ice wax pressing refers to the process of gently forming the individual trichome heads together through gentle pressure. The pressure breaks the epidermis of the trichome heads, forcing them to combine together into a unified product. Breaking open the trichome heads also reveals the full flavor of the terpenes contained within, resulting in a fragrant and flavorful product. Like bubble hash, there are several ways to grade the quality of full-melt bubble hash, although most should be 6*. Full melt is the highest grade and usually contains around 90% trichome resin heads, meaning it will vaporize fully when dabbed without leaving traces of combusted plant matter on the nail. This form of concentrate has an earthy aroma and is more potent because the majority of cannabinoids and terpenes are found in the trichomes. Full-melt bubble hash varies on price depending on the dispensary, however, expect to pay between $35 AND $70 per gram. Dry sift at its core is refined kief, which is often manually or mechanically extracted using several micron screens (over and over again) to keep the trichomes intact. Like bubble hash, there are several ways to grade the quality of dry sift. Full-melt is the highest grade and will usually contain around 90% trichome resin heads which means it can be dabbed, while half-melt will contain both trichome heads and stalks (and other plant matter). Kief is the lowest grade, which will contain the most plant contaminants and is not recommended for dabbing due to the high plant matter concentration. Similar to live kief, live sift is made from fresh-frozen flower (meaning the plant was cut at harvest and immediately frozen) to keep all of the cannabinoids in tact. This method produces more potent and highly flavorful, aromatic end products. Dry sift is also very fine and often looks beige or tan in coloring. It can be used on top of a bowl or consumed on its own. This form of cannabis is more potent because the majority of cannabinoids (THC or CBD) and terpenes are found in the trichomes. Dry Sift varies on price depending on the dispensary, however, expect to pay between $15 AND $30 per gram. Rosin has gained popularity in recent memory, however, extraction through heat and pressure has been around for quite some time. Producing rosin involves the use of high heat and high pressure to isolate the resinous essential oils from trichome heads to create a solid form of resin. Rosin is debatably the easiest and safest way to make dabbable concentrates. Additionally, it is also legal to produce at home since it does not require solvents. This is why it has been deemed the "everyman's" concentrate. That doesn't mean rosin is a lower grade or average by any means though. In fact, rosin is one of the only types of concentrate that is a direct reflection of the starting material used to make it. That means without exceptional starting material, it is impossible to make high-quality rosin. In the early stages, many people used hair straighteners, repurposed t-shirt presses and even tortilla presses to make rosin. While these machines do get the job done to a certain extent, they are far from efficient, sparking consumer interest in industrial-grade options. This yearning for more powerful and efficient rosin presses instilled a do it yourself movement amongst cannabis enthusiasts who were eager to build their own extraction units. These units are definitely more effective than hair straighteners or t-shirt presses, but have proven to be dangerous and imprecise (and certainly not recommended to try at home). Recently, many new equipment and products have hit the market to help create safe, quality rosin extractions. Small, semi-portable hydraulic presses have become favorites for home-extractors, and have opened the possibility for cannabis concentrate enthusiasts to make legal and effortless extracts from the comfort of their living rooms. On a commercial level, companies like PurePressure have created purpose-built machines for the sole purpose of extracting rosin efficiently and effectively (they even have an at-home model coming soon). Their rosin presses are made in the USA with reliable parts, which is why some of the country's top extraction companies are using their Pikes Peak presses. With countless features and exact parameter control, it's a no-brainer that serious rosin extractors are turning to PurePressure for quality presses. Example of pressing some bubble hash into rosin. Rosin allows more people to experiment with making concentrates. And because solvents are not introduced in the process, the chemical structure of terpenes and cannabinoids within the flower are unaltered, which is why rosin is often considered one of the purest and most flavorful forms of concentrate. Aroma, flavor and taste of rosin vary greatly depending on factors such as the starting product used (flower, kief, bubble hash) plus the actual extraction method (as rosin demands high temperatures around 220-350 degrees Fahrenheit). If the starting product has low-resin, the end-yield will resemble poor resin production as well. A common industry saying that holds true for non-solvent extraction is "Quality In, Quality Out," as the finished product is a direct reflection of the grade of the starting material. It is important to note that specific strains are known to produce better rosin than others, although most appear to be a yellow-amber hue and can take on consistencies of sap, budder and shatter. It's important to note that a little research is necessary to make sure the best product is created. Rosin varies on price depending on the dispensary, however, expect to pay between $30 AND $80 per gram. Like flower, there are many ways to consume concentrates. Some are more effective than others, but ultimately it's a simple matter of personal preference at the end of the day. The most popular method of consuming concentrates involves using a dab rig in combination with a small butane torch to heat a nail for the concentrate to evaporate on (discussed earlier), however more discrete and safer ways are becoming increasingly popular, like the portable vaporizer pen or e-rig. No matter which method you choose, be sure to research which way will be most enjoyable and convenient for you to ensure a positive and pleasant experience. One of the easiest ways to smoke concentrate is to add it to flower (also known as bowl-topping). By doing so, you'll be able to get some of the potent effects of concentrates without getting too high or increasing your tolerance much. This is a great way for beginners to start on concentrates. Simply pack your bowl with flower, and then add a small piece of wax, shatter or budder on top. You can also try layering it between flower in the middle of the bowl. If you like joints or blunts you can sprinkle concentrates inside before rolling or try twaxing, which involves stretching shatter into a thin rope and wrapping it around the outside of the rolled joint. Only certain consistencies of concentrate work well for twaxing, so be sure you fully understand the consistency of your product before handling it. An unstable consistency will end up sticking to your hands and wasting precious concentrate! Bubble hash is arguably the most effective concentrate bowl-topper, as it has similar combustion properties to flower. However, bubble hash tends to stay lit like a match if it gets too much heat, so be sure to put out the flame or smoke quickly. The best way to smoke bubble hash on a bowl is to let the flame get close enough to the hash that it starts to bubble and melt, without actually setting it on fire. Once the bubble hash is melted into the bowl, it should be easier to smoke and burn much more consistently. Using a vaporizer - whether desktop or portable - is one of the most efficient ways to consume any concentrate. Not only are vapes discreet, but the user typically has more control over how they're consuming the product. For instance, depending on the kind of vaporizer you have, you'll find several heat options to utilize. This functionality is great for allowing the consumer the ability to change the temperature to match the kind of concentrate they're smoking and their various melting points. Vaporizers with variable heat are extremely useful to help gauge the amount of concentrate you are consuming, as well as the intensity of the hit. Generally speaking, it is always advisable to start on a lower temperature and slowly increase until the desired temperature is received. Starting off too hot may produce a hit that is overwhelmingly large, which might lead to an uncomfortable or unpleasant experience. There are two main types of vaporizers for concentrates. Some use conduction and allow consumers to directly apply concentrates to the heating element. Other devices use convection and have a chamber to place the concentrate. Most convection vaporizers are more expensive, however tend to be more durable and don't have to be replaced as often as atomizers (the heating element) in conduction vaporizers. Many choose to invest in desktop vaporizers because of durability. Vaporizers like the Volcano are great because of their balloon-style bags that are easy to use with a group. Consumers just load the vaporizer, press a button, and once the bag fills it's ready to consume. On the other hand, portable vaporizers have risen in popularity thanks to the convenience factor of consuming on the go. Typically, these vaporizer pens are charged by USB and are designed to tackle a variety of concentrate end products. People prefer different options, so do your research and try out a few different products before settling. Dabbing is the method that's enjoyed by the majority of concentrate lovers. One of the reasons dabbing is so popular is because there are several options to customize your rig and attachments. Concentrate enthusiasts often use this avenue to express themselves and customize their ideal dabbing experience. The first step in dabbing depends on what you'll dabbing from, however, you'll want to grab your concentrate, torch or e-nail and dab tool regardless. Before we dive into this section, be aware that higher grade rigs made with German or American borosilicate glass provide the best dabbing experience, and the smaller the rig, the better the flavor. To set up your dab rig, the first step is to fill it up with water. The necessary water level varies depending on the rig being used. A general rule of thumb is to fill the water about an inch or two above the downstem or diffuser. Making sure the diffuser is immersed underwater is crucial to establishing proper percolation when inhaling. To check and see if you have a good water level, simply inhale through the mouthpiece. If you get water in your mouth, pour a little out. Ideally, you want to hear a slight chugging sound and feel a little resistance when inhaling. There should be enough empty room in the chamber for the water to bubble without getting in your mouth or spilling out of the downstem hole. The next step in setting up your rig is placing your nail or banger into the joint. Joint sizes are measured in millimeter, and are commonly seen in 10mm, 14mm and 18mm sizes. You'll want to make sure your nail matches the millimeter of the joint connecting to the downstem of the rig, otherwise it won't be able to fit properly. If you'll using a brand new nail, be sure to season it before doing a dab. Using a new nail can leave you with an unsavory, metallic or chemical taste during your hit. To prevent this, we recommend seasoning new nails to remove leftover polishes from the manufacturing process. Seasoning not only helps avoid a period of gross hits, but also is more beneficial to the health of the consumer. To properly season a nail or banger, first heat it evenly until it's glowing red-hot. Then, add some concentrate to the nail and paint it over the whole nail. Once the nail cools, repeat the previous steps 2-4 more times. It is important to note that the quality of concentrate used during seasoning does not have to be great. You can even use reclaim if you prefer to save your more potent concentrates for personal consumption. The more you season, the better the flavor will be in the long run. 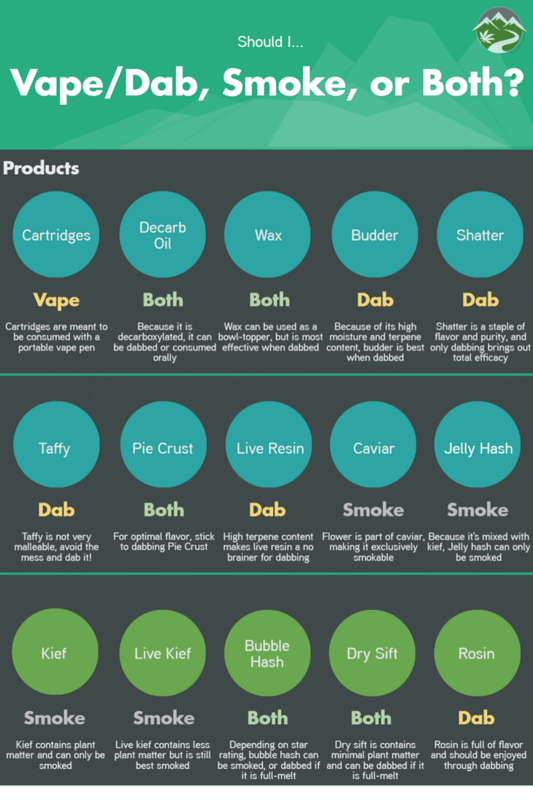 There are currently many methods to take a dab, and many products on the market that allow for effective vaporization. However, concentrate connoisseurs have recently adopted one method into their daily routine that has taken the cannabis community by storm. It's called "low-temp" dabbing and utilizes minimal heat levels to evenly vaporize the desired concentrate. "Low-temp" dabbing allows for optimal flavor and consumption of cannabinoid profiles, which is why it is highly regarded as one of the best ways to take a dab. To initiate the process, heat the nail until it is red hot. The amount of time to wait after heating the nail is dependent upon the type of nail being used, but generally ranges from 15-40 seconds. Once the correct amount of time has passed, collect the desired amount of concentrate on the dabber, gently place the concentrate onto the nail and inhale gently. There is no need to scrape or slide the dabber, as the heat will melt the concentrate evenly onto the nail. When all of the concentrate has transferred from the dabber to the nail, place the carb cap over the nail to allow an even convection. After the concentrate has been effectively vaporized, all that's left to do is finish inhaling the dab. If completed properly, the dab should be quite flavorful and leave a yellow-gold puddle in the nail (black residue means the dab was too hot and potentially combusted). The final step is wiping out the cup of the nail with a Q-tip. There are two main types of nails, domeless and domed (hooded). The main difference between the two is airflow. With a domeless nail, there are ventilation rings underneath the nail, which allows air to flow into the rig directly, and therefore no dome is needed. Quartz bangers are another domeless option, utilizing a deep-chambered dish to draw vapor into the rig. Air doesn't flow directly into the chamber with a domed or hooded nail, therefore the dome is used to catch the vapor, allowing you to inhale it into the rig. The carb cap can be used with a domeless nail to help you take a low-temperature dab. Most carb caps, like nails, are made of titanium, quartz or glass. When a carb cap is placed over a nail, it changes the pressure in the small distance between the nail and carb cap and creates what is known as convection. A small hole at the top of the carb cap allows a minimal amount of air in, which swirls like a vortex and cools the nail, oil and vapor for a smoother dab. Carb caps also let you pause a dab. If your lungs are full of air, you can apply the carb cap to your nail and exhale without losing vapors off the top. They're great especially for those new to concentrates since they allow you to take a break mid-dab and preserve the precious oils on your nail at the same time. Using a butane torch can be intimidating and looks a little similar to using other drugs, however, heed a few precautions and you'll find it's not as scary as it seems. Consider what dabbing is; heating a small piece of metal, quartz or glass to 300-400 degrees with just a lighter would be impossible. Torches heat metals quickly, as the average flame temperature of a torch is 2600 degrees F and a lighter is around 800 degrees F.
Alternatively, you could use an electric nail (or e-nail) which allows consumers to take dabs without having to use a torch. Instead, the nail is connected to a metal box by a coil that heats the nail. They often have a display with temperature options which makes dabbing easier, notably for even heat distribution and the ability to take a dab at a moment's notice. Another option for those intimidated by torches is using an electronic rig (or e-rig). E-rigs allow consumers the convenience of a discreet, portable dab rig that is battery-powered and easy to use. E-rigs are compact and come equipped with all the essentials needed for dabbing. With no torch required, e-rigs only need the push of a button to properly heat the nail to optimal dabbing temperature. There are several methods of maintenance and upkeep that you should abide by on a daily basis to ensure your rigs are functioning 100% effectively at all times. The first tip is to always use purified or distilled water when filling. This ensures the highest quality filtration when vaporizing and guarantees your concentrate will not pick-up any unwanted tastes or flavor during sublimation. Additionally, using purified or distilled water prevents those pesky hard water stains from appearing on the glass. The next tip on rig etiquette is using a dab mat or pad. Dab mats safeguard your rig from unclean surfaces and prevent scratches. Dab mats come in a variety of shapes and sizes to meet the needs of any rig. Unless you'll totally sure there's no risk of a scratch, it's strongly encouraged to set a pad down at all times. Moving on to the nail or banger, to keep it as fresh and long-lasting as possible, it is recommended that you employ "Q-tip tech" after every dab taken. Using a Q-tip to clean out the nail or banger after every dab keeps residue from compiling on the surface, translating into more flavorful hits and extended longevity of the nail. Another way to improve the longevity of a nail or banger is to avoid sliding or scraping the dabber across the surface. This can result in abrasions of the surface and make cleaning more difficult. It is best to gently touch the dabber to the nail and allow the concentrate to melt off onto the surface. Your nail or banger will thank you! The final tip for rig maintenance is frequent and effective cleaning. Allowing reclaim to build up is not only unsightly, but can create issues, such as the nail or banger fusing to the glass. To ensure the safety of your rig, always be sure to properly maintain cleaning and upkeep. There are many ways to clean a rig, but the most effective is simply 91% isopropyl alcohol and warm water. Gently washing the rig first in warm water loosens the reclaimed concentrate from the glass, making only a small amount of effort necessary when using the isopropyl alcohol to bring out a squeaky clean finish. Always air on the gentler side when cleaning and allow the alcohol do most of the work. If the rig is routinely cleaned, all the residue should come off with minimal effort. Rig etiquette and maintenance is crucial in maximizing the potential of your set-up. If done correctly, the payoff is certainly worth the time. One simple way to dab concentrates is to use a honey straw or nectar collector. These devices allow you to dab without a complicated or large rig setup. Although made of glass, these are far more portable than other complicated rig setups. Use a torch to heat the end of your piece until it glows red and while inhaling, press the heated end into your concentrate. Honey straws are convenient since they don't have a chamber to fill for water and require the least amount of preparation. Nectar collectors have an advantage since the water chamber helps to make the vapor smoother to inhale. There are several different ways to store concentrates to preserve them at their peak freshness and to prevent them from drying out. While the decision is a matter of personal preference, stick to airtight containers in cool, dark places, as concentrates tend to melt easily if exposed to warm environments. If this happens, they'll most likely lose cannabinoids, impact flavor, aroma, etc. Many people prefer to store their concentrates in small, medical grade, silicone containers. What's great about silicone containers is that they're non-stick, easy to clean (just boil them in water) and act as a good insulator to keep your product from getting too warm. They're also reusable, won't break and you can take dabs directly from them. If you're using something like a honey straw or nectar collector, these products make it easy to smoke on the go, specifically when traveling. Another popular option is parchment paper. It's inexpensive, can be found in many kitchens and prevents anything from sticking to it thanks to a very thin layer of silicone. This is key, as you want your concentrates to be able to be easily lifted from the paper before consuming. Don't get it confused with wax paper, which is coated in actual wax and will stick to any product that's placed on it. You'll find that some concentrates from dispensaries are sold in transparent plastic or glass containers. While these can be a strong option and allow you to see your concentrate at all times, they are not non-stick and as a result, some concentrate is at risk to be wasted. Glass containers are often created with heat-resistant, tempered glass however and are a great option for use with a nectar collector or honey straw. As you now know, concentrates are just that, a concentrated product with THC levels between 60%-80%. You're probably used to smoking flower that averages 10%- 25% THC, so a little goes a long way when it comes to dabbing. One of the most common mistakes beginners make is consuming too much shatter, wax or budder, etc. Doing so will result in an uncomfortable high for anyone involved. As a result, the first tip for beginners would be to start small, as they don't call them "dabs" for nothing! Starting with only a tiny piece of concentrate will also allow you to determine your personal tolerance for consuming concentrates. As with most things, you can always do more if necessary. If you're using a dab rig, the act of heating a nail to the appropriate temperature requires the use of a torch (often with butane). As a result, proper torch safety is key to making sure you don't hurt yourself or someone else. Try not to use any auto lock feature to ensure full control over the flame when you apply it to the nail, and always be sure to refill your torch outdoors or in an area with proper ventilation. When using a dab rig, make sure you set it on a mat while consuming. These padded, soft mats (often seen in silicone) ensure that your rig won't slip off the table or get scratched up from a hard surface. When you're dabbing, temperature is key. You want the nail to be hot enough to vaporize the wax or shatter, but not so hot that your concentrate combusts and leaves you with a poor taste and a harsh hit. One of the biggest learning curves for most beginning dabbers is understanding how to perfectly heat the nail for a good hit. If you're using anything other than glass, get the nail red hot until it's glowing. As it cools, put your hand over it and wait until it's just bearable to hover close to it. Note that for quartz and titanium, you'll want to wait a bit longer as these materials tend to retain heat better. It will most likely take a bit of trial and error, but you'll soon learn how to properly heat your nail to get the smoothest hit possible. When handling a torch, make sure to only heat the nail and not the rest of the rig to prevent discoloration and potential broken glass. While it goes without saying, if you're heating an element with a torch at extremely high temperatures, it's in your best interest not to get too close. Remember that the nail will stay hot for a period after it's heated, so it's best to wait a bit before touching. If you're looking for a dab rig, try to find smaller pieces of glass without large percolators, as any diffusion will dilute your hit. Glass pieces are favored to enjoy the taste of the concentrated terpenes. If you want to avoid using a torch to heat up the nail, explore an electric nail. Basically, it's a metal box with a port for a coil, a switch and a PID that gauges your coils current temperature. Consumers enjoy the ease that comes along with an e-nail as the device heats up to the perfect temperature each and every time and it will stay cleaner, longer. To keep your setup going strong for a long time, make sure to clean your tools often. After using a dabber, heat the end to easily remove residual product. As for the nail, use a Q-tip, a dabber or a torch (to burn off the extra concentrates) to ensure a clean set up for next time. In general, make sure your dab rig stays free of lingering concentrate to ensure the best, most flavorful hit every time.